May Sinclair “‘came to dinner sometimes [wrote the novelist I.A.R. Wylie] and talked mainly about cats'”. (14) the great glad earth and ‘Heaven’s trackless ways’. There was a great deal of this kind of thing at the lower and easier end of the repertoire, where eggs were always brown, the women always kind, and the earth always glad. But the poetry was meant to give pleasure and it was, after all, the last body of English poetry to be actually read, by ordinary people, for pleasure. 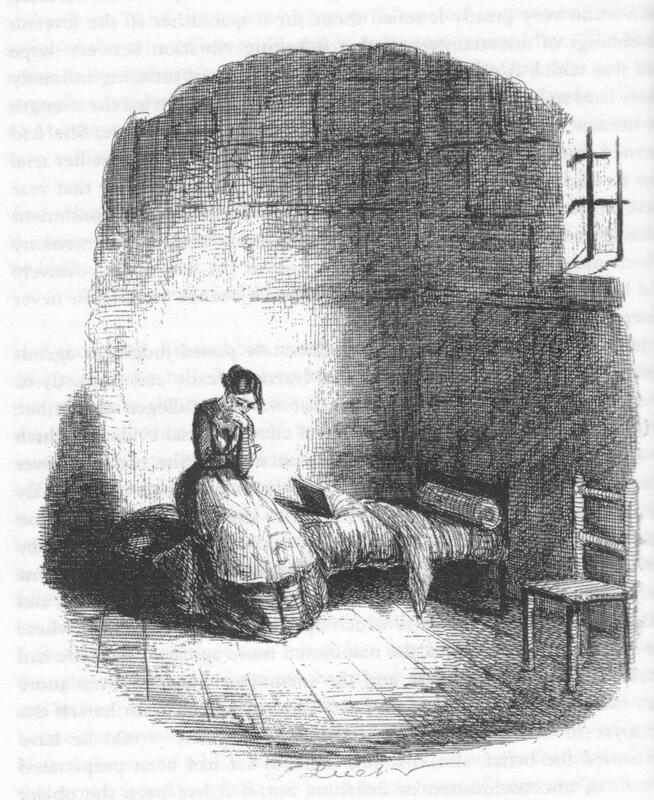 Her life was affected by family mental illness – a brother and a sister both died “insane”, and she and a surviving sister agreed not to marry in case they passed on madness – by caring for her elderly mother, by her lesbianism (mostly unacted on apart from a farcial and humilating episode with May Sinclair), by poverty and guilt. It is difficult not to think that her life would have been happier if she’d been born a hundred years later. To them, yes, every pane. I read this mainly for the Nick Drake essay, though the others are also interesting. Argues that Drake had read about Buddhism and had a naturally Buddhist sensibility, “boiled down to the linked recognition that life is a predicament and that the world is ultimately an irreducible mystery”. MacDonald reads “River Man” as a description of enlightenment versus everyday life: “The river is the realm of material life wherein the senses wander and the mind gets lost in the flow of time and thought”. The woman in the song, Betty, considers “leaving the everyday life for the life of detachment,” but decides against it. MacDonald thinks the final lines “Oh, how they come and go” are a reference to reincarnation. Have to say this all seems a stretch to me. What a muddle, but powerful despite that. 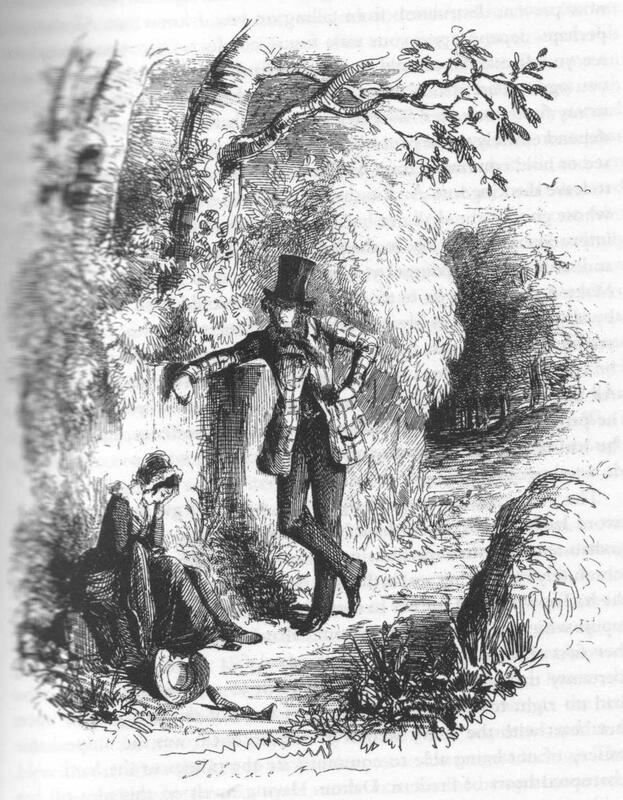 In an instant the thought suggested itself to Frederic Dalton that Jessie has abandoned her child, with the certainty that a few hours of such abandonment would cause its wished-for death, and his heart leaped with mingled agitation and joy as he thought that he should be thus saved from all future danger of discovery or inconvenience. 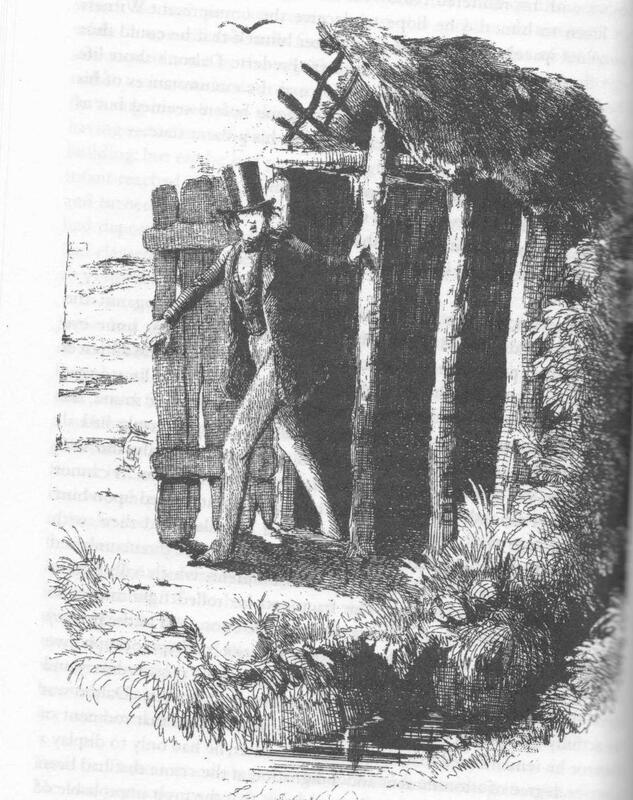 … but … the infant’s piercing cry again smote his ear, and the wretch paused to curse it, as he remembered the probability that it might live till noonday brought wanderers, either for pleasure or for business, through the lane, who might, and must discover its existence, if it repeated such cries as it was then uttering. “Confound her idiot folly!” he exclaimed; “if she had common sense enough to determine that it should perish, why could she not silence this confounded cry?” He had turned as he muttered these words, and was again standing over the spot where the child lay. Again it uttered a sharp piercing cry. He raised his booted foot, and made a movement as if in sudden rage, and the piercing cry was heard no more. The body is discovered some days later, and Jessie is tried for infanticide. Ellen discovers her brother’s guilt and tells him to leave the country. Instead he recklessly falls into a river and is drowned. As she stands in the dock at the end of her trial, Jessie hears this mentioned. The verdict is then announced, not guilty on the grounds of temporary insanity, and Jessie is found dead in the dock. There are two subplots. The first concerns Ellen, who is in love with the local nobleman, who has decided on his parents’ advice that he can’t afford to marry her because of their joint poverty. At the end of the book they do in fact marry. The other, slighter, subplot concerns Ellen’s friend Martha, who falls in love with a lawyer whom she persuades to work on Jessie’s behalf. Although these are strictly subplots and the main business of the novel is with Jessie, in fact Ellen’s story, in particular, takes up a good deal of space, probably more than Jessie’s. Elsie B Michie writes that “The juxtaposition of these plots makes the novel a strange hybrid that combines the dark concerns of reformist prose with the romantic brightness of earlier nineteenth-century fiction”. As you can see from the quotation, Trollope can’t leave well alone. For goodness sake, why qualify the text with the stuff about why the wanderers might be there? And the first sentence could be cut off after “mingled agitation and joy”. Trollope has two political targets in the book. The first is the workhouse system brought about by the amendment to the Poor Law in 1834. Trollope shows it as abusive, humiliating and pointless. Although Jessie is perfectly able to work, she can’t work whilst she’s in the workhouse, she has to associate with women who are “of that wretched class of females which a seaport town is sure to produce … prostitutes,” and when she wants spiritual advice the visiting minister refuses to talk to her. 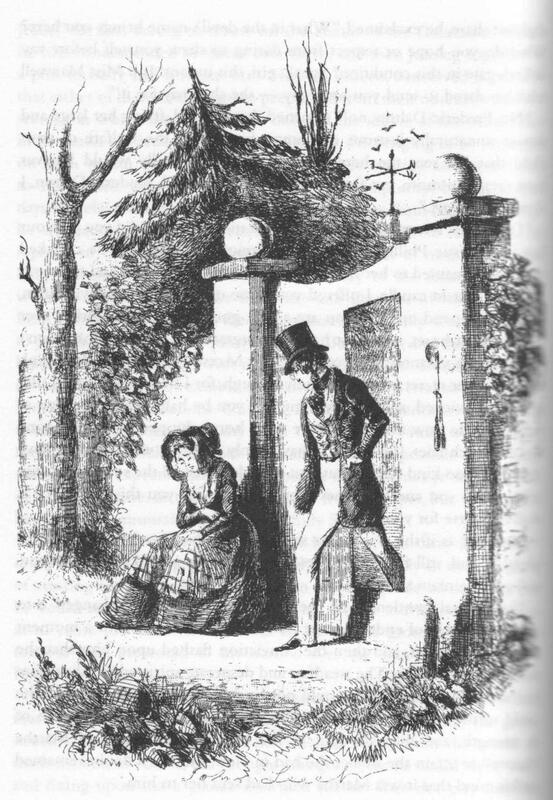 Trollope’s second target is the Bastardy Clause in the same Act. This made mothers of illegitimate children solely responsible for their support; the fathers had no duties. There is a longer summary here. A fascinating book, though it needs more crochet references. And if it were written now it would be differently feminist, I think. Here is Washington “conducting plantation affairs by correspondence with his manager”, in several letters. Doll at the Ferry must be taught to Knit and MADE to do a sufficient day’s work of it, otherwise (if suffered to be idle) many more will walk in her steps. Lame Peter, if no body else will, must teach her, and she must be brought to the house for that purpose. The deficiency of Stockings is another instance of the villainy of those I have about me, for, as you justly observe, it is impossible for that Lame Peter and Sarah’s work could amount to no more than 60 pair. The Gardener’s Wife must NOW see that there is a just return of all that is given out and taken in, and when the work is handed over by her, to you. I am persuaded it will be safe. Let the Gardener’s wife give work to, and receive it from Lame Peter, as well as others; and then the whole will come under one head. Their reports ought to be dated. And can Lucy find sufficient employment in the Kitchen? It was expected her leisure hours, of which I conceive she must have very many from Cooking, would be employed in knitting, of which Peter and Sarah do too little. The same attention ought to be given to Peter (and I suppose to Sarah likewise,) or the Stockings will be knit too small for those for whom they are intended; such being the idleness, and deceit of these people. The book is dedicated to a Peter – I like to think that this is in recognition of Lame Peter. 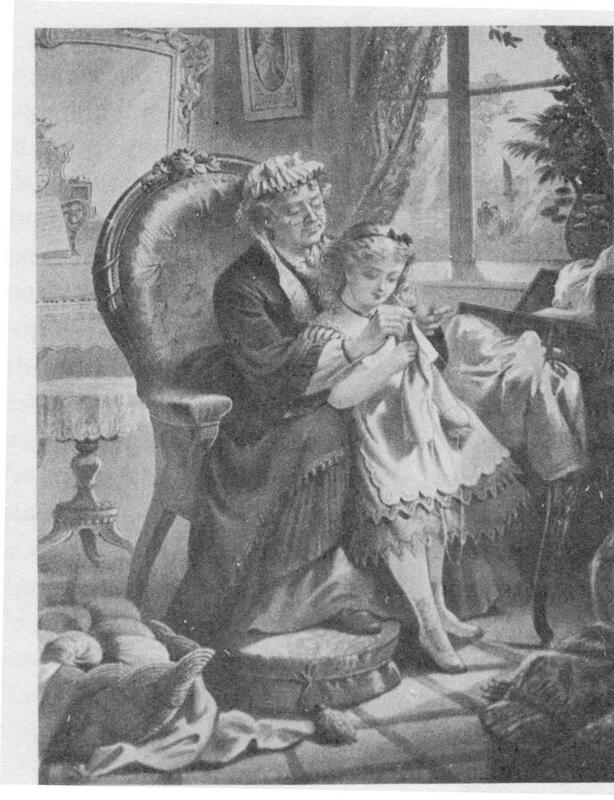 Macdonald identifies knitting as part of war culture. For instance, she mentions songs about knitting from the Second World War, such as five separate songs called “Knittin’ from Britain” in 1941, “Knit One, Purl Two” recorded by Glenn Miller, “Knittin’ on a Mitten” and “Stick to Your Knittin’, Kitten”. She quotes two 1918 plays. The Knitting Club Meets or Just Back from France, in which Jane, “very slender [with] a spiritual face … dressed in a shabby tailor suit, somewhat out of date, but with neat hat, gloves, and shoes” tells the members of a knitting group about what she has seen in Red Cross camps in France, energising people like Lucy, “a rather silly person dressed in the height of fashion, [carrying] a magnificent knitting bag”. Another play from the same year is The Knitting Girls Count One. And a silly bit for J – “famed golfer Babe Didrikson Zaharias’s comment … “When I really want to blast one, I just loosen my girdle and let ‘er fly”. The M helped me write this entry by reading bits out to me. The M says “I liked the pictures because they are black and white, not like normal pictures now, and there’s a picture of a little girl knitting with her grandma, and their swimming costumes are not like the swimming costumes we have now because they are knitted”. 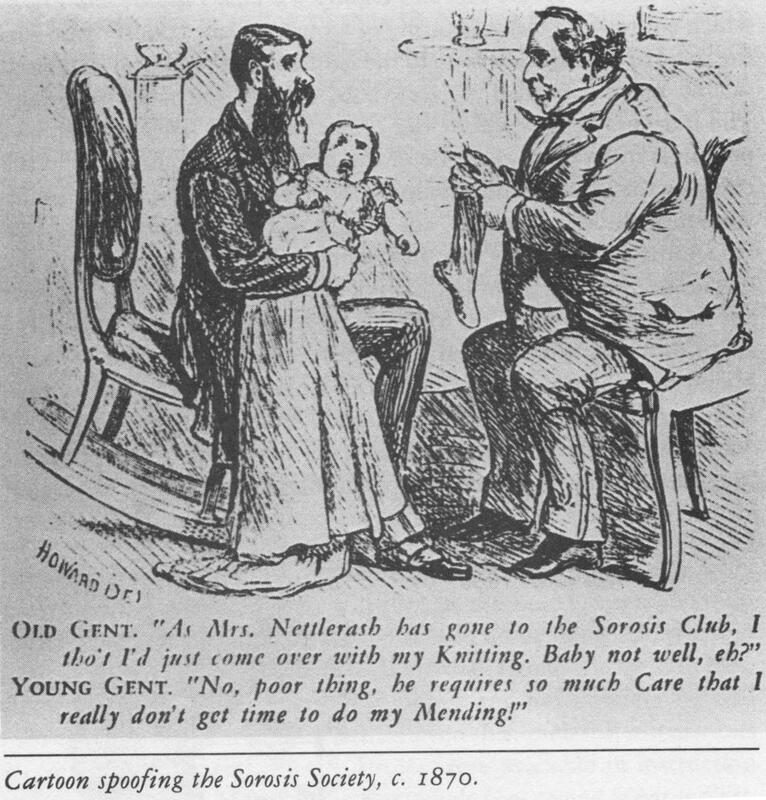 Cartoon, about 1870, spoofing the Sorosis Society – an early women’s club. 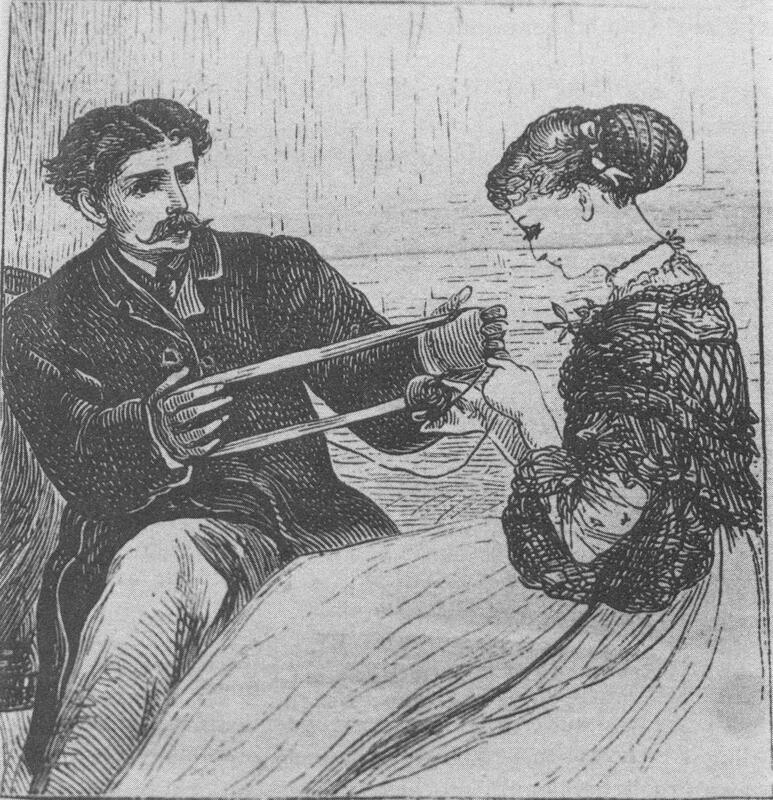 The Winding of the Skein, 1868. 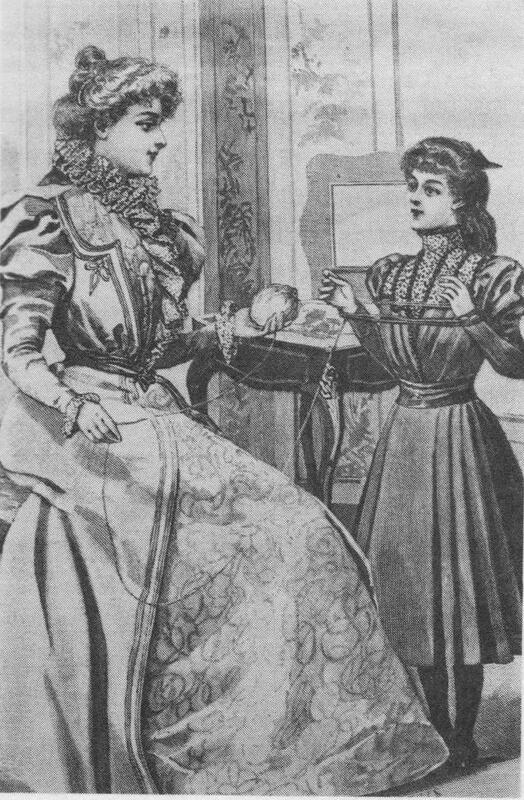 Winding Up the Yarn, 1897. The cradle to and fro. For my grandam she would darn it. So she daren’t work you know. Been thinking a lot about plots recently, and a sense of never having had one. It’s made me realise that this is one of my probs with the 1811 story; so I think that’s what the story needs to be about, getting away from the dead hand. Wch is difficult whilst still trying to be faintly historical. My views seem to be up a lot, and as a result of some odd searches. “Destroyed place,” for instance, and “word first page”. Also “ПЕЧАТНЫЙ СТАНОК,” wch apparently means printing press in Russian. You are currently browsing the Books and Pictures blog archives for February, 2011.